Twin Spin is one of Net Entertainment's most thrilling creations yet. It uses the style of the traditional slots machines, and their symbols, such as the famous 7, Bar and cherries. The most interesting aspect in this game is that there are at least two identical reels, and 243 different winning combinations are possible. You should regularly win money at the game, but you probably will also have a few spins without any winnings. For this reason, we classify the game as one of a medium variance. The theoretical return to player is 96.6%, which is good for a game like this. 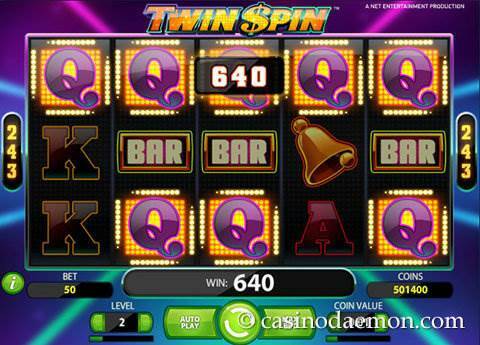 The game Twin Spin is also available for mobile devices and part of the Netent Touch series of games. You can play it on iOS and Android devices. 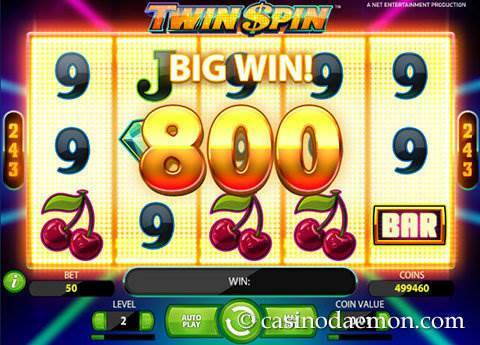 Here you can try out the fantastic game Twin Spin for free and you can try your luck with play money. If you would rather play the game for real money you can find it at one of the online casinos mentioned on this page. With every spin two of the reels are identical from the start. However, it can randomly happen that these expand and cover three, four or even five reels. If you have five identical reels you usually win a lot of money. The starting position of the identical reels is not the same in every spin, it varies every time, and they can appear on any position. 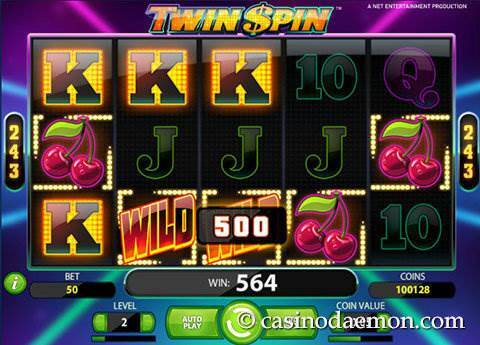 The Twin Spin slot also features a wild symbol that replaces other symbol for winning combinations. When you manage to get five symbols with diamonds on a pay line, you will receive 1,000 coins that are also multiplied depending on the bet level. This slot game does not have a bonus round, or other special symbols. 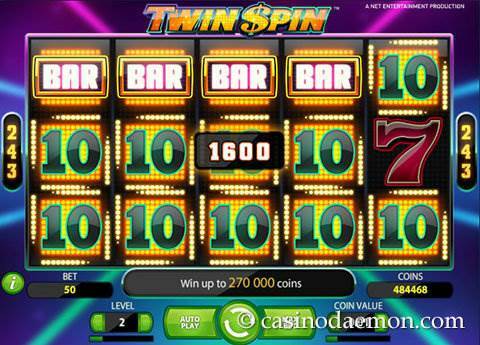 However the Twin Reel Feature makes this Netent slot game incredibly thrilling. With a single spin you can win up to 270,000 coins. The 5 reel slot Twin Spin offers 243 ways to win. In order to have a valid combination, the symbols have to appear on the reels at least once, and always next to each other. The combination starts from the left. Therefore, the slot doesn't have any pay lines any more, the symbol's position on the reels does not matter, as long as it appears on at least three adjacent reels, starting from reel 1. The slot game requires you to bet 25 coins per spin. Wagers start at 0.01 £/€/$ and can go up to 0.50 £/€/$ per spin. There are also 10 bet levels to choose from, which multiply your wager accordingly. The minimum wager at this game is 0.25 £/€/$ and the maximum you can wager in one round is 125 £/€/$. The game also features automatic play with more possible settings on when to stop. See Twin Spin in action! Five identical reels rewarding great wins. This game is surely entertaining and thrilling!